Subject to prior sale! Because these are exhibition models, there may be minor damage such as spots or scratches! Tables and desks. Frame in natural anodized or polished aluminium. Built-in tops of matt ceramics (in anthracite grey, light grey, medium grey and white), or lacquered tempered glass in orange, black, light grey, red, yellow, green, white; white HPL or LG HI-MACS, Alpine White finish. Versions: with a small opening for cable access; with tops allowing access for cable management; face-to-face; with a shelf. 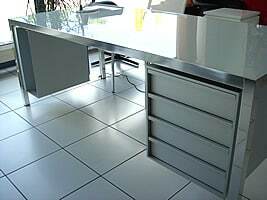 Accessories: drawer cabinets, filing drawers cabinets, CPU cases, modesty panels, raceways and trays for cables and outlets. the neutrality of aluminum, the strength of wood, the integration with color and forms. Do you have a question about "Desk"? How can we contact you?